Austin, TX – August 23, 2017 – The University of St. Augustine for Health Sciences (USAHS), a leading graduate institution that emphasizes health and rehabilitative sciences education through innovative classroom education, provides students, faculty and employees alike opportunities to volunteer and make a positive impact on the communities where our university community lives, learns and works. The most important moments happen unexpectedly. Fate. Karma. Serendipity. A single instance can change the course of a life, or, in the case of Brennan McQuiston, more than one life. McQuiston is a physical therapy student at the University of St. Augustine for Health Sciences Austin campus. In September 2016, McQuiston was at a university sponsored community outreach meeting where a representative from Be the Match Registry spoke. 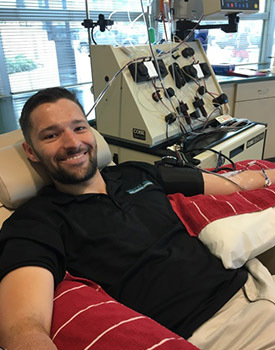 The Be the Match Registry is part of the National Marrow Donor Program and works to connect cancer patients seeking a cure with potential bone marrow donors. Despite knowing the odds were extremely small that he – or any of the other students at the meeting – would be a match, McQuiston signed up. He filled out the paperwork, took a cheek swab for DNA, and added his name to the registry. Like many of his fellow students, McQuiston was drawn to physical therapy because he wanted to help other people overcome their challenges and limitations. Physical therapists engage with patients, sometimes over an extended period of time, to recover from trauma, to mitigate physical limitations, and to generally improve their physical health. These relationships — although professional — can form into close bonds as therapists are challenged, motivated, and inspired by their patients. It’s not for everyone but many of those who are drawn to it are empathetic, other-focused people. Joining the registry was another way for McQuiston to give back. Months passed and McQuiston forgot about the registry, until this past April. A month after giving his blood sample, McQuiston received confirmation that he was a positive match. McQuiston moved ahead and was next subjected to a battery of medical procedures: more blood tests, an EKG, a chest x-ray, and injections of filgrastim, a drug that stimulates bone marrow to produce more peripheral blood stem cells (PBSCs). After receiving four consecutive injections, McQuiston – who is from Austin, Texas – flew to San Antonio where he received a final filgrastim injection. He then donated through a process, similar to dialysis, which filtered his blood and removed the life-saving PBSCs.